I have another delicious dinner recipe for you! The last one I shared was my crock pot sweet potato beef chili (in case you missed it, you should probably check it out ;)), and now I have a calzone recipe for you. We made these calzones last week on a night when our weekly meal plan said "pizza or calzones." Well, we haven't made calzones in quite some time, so they won out! And I'm glad they did. 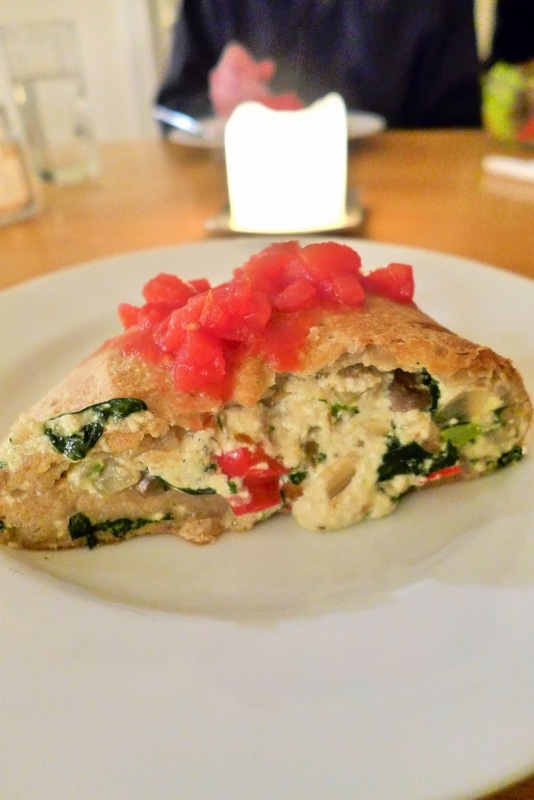 The recipe I semi-followed is from Two Peas and Their Pod for kale, mushroom, and ricotta calzones. I ended up adding a couple more veggies to the mix when I made these, but in general, I followed their technique for the most part. It's definitely a versatile recipe. Add whatever vegetables (and perhaps meat?) that you and your family like! The ingredients below are roughly what we added when we made our calzones. Make sure pizza dough is already at room temperature. Preheat oven to 400 degrees. For the calzone filling, saute olive oil and diced onion over medium heat on stove, 3 to 4 minutes. Add minced garlic. Add the mushrooms, red pepper, and broccoli, sauteing for 5 to 7 more minutes. Add the spinach and cover pan; cook for 2 more minutes or until spinach is wilted. In a large bowl, combine the ricotta, shredded cheese, and pecorino romano. Stir in the vegetable mixture, and then add all the spices. Divide the dough into four equal portions and shape each portion into a ball. On your workspace, sprinkle flour. Roll each ball of dough out into a circle or oval, about 7 inches in diameter (just do the best you can with this!). Lightly brush the edges of each circle with water. Place desired amount (about 1/2 to 2/3 cup) of cheese/vegetable mixture on half of each circle, leaving an inch around the border. Gently fold the dough over so the edges meet, and press down around the edges with your fingers or a fork. Pierce the top of each calzone with a fork, and brush the top of each with a little extra olive oil. Repeat until the filling is used up. Bake calzones for 18 to 20 minutes or until golden brown. Let cool for about 5 minutes before serving with warmed marinara/tomato sauce or diced tomatoes for dipping. Also, I did not do the best job ever of shaping the pizza dough to be as thin as I would have liked. As you can see in the pictures, the edges of the dough were a bit thick in spots. As I said above though, just do the best you can with your dough. These calzones will taste excellent, no matter the thickness of your dough! Pizza dough is pretty great in any size, shape, or form, in my opinion! Such an easy weeknight meal! We served these with side salads and were completely satisfied. I can't wait to make them again!